Esteemed Innovation Journal -- There are entries for all of the gadgets, tools, devices, and concepts in the mod, in the spiffy Esteemed Innovation journal. It includes recipes, even for alloying with the metalcasting devices. Metalcasting -- The first devices in the mod, the Carving Table, Crucible, and Mold. These devices allow you to cast metals, gild metals, and create new alloys like Brass. Molds let you form these into different material forms, like plates, ingots, and nuggets. Steam Generation -- Steam is generated in the boilers using solid fuels and water. It can be stored in tanks, transported with pipes, and steam content can be measured with the steam gauge. Steam Heaters -- One of the steam devices, the Steam Heater, uses steam to heat up vanilla furnaces (and crucibles!) instead of solid fuel directly. Using the steam heater adds a boost of smelting speed, efficiency, and allows you to create better cooked foods. Steam Hammers -- The Steam Hammer is a machine that allows you to use an anvil with a steam cost instead of experience. Steam Exosuit -- The Exosuit is a modular armor suit that you can upgrade with many, many upgrades in the Engineering Table. Each piece can have 2 upgrades. Thumpers -- The Thumper is the mod's automining solution. It thumps the rock beneath it, leaving no visible damage from the surface. It drops all of its mined resources in the hole created, which can be gathered using a Vacuum. 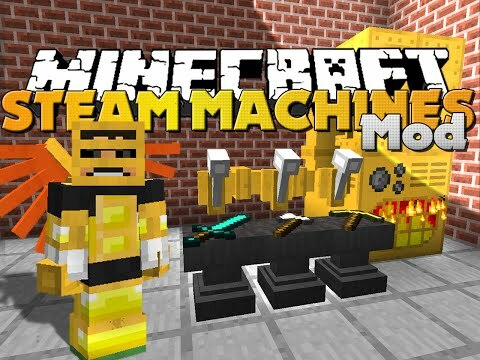 This is a simple tutorial that will helps you to install Flaxbeard’s Steam Power Mod for Minecraft 1.13, 1.12.2 and others version successfully! Download the Flaxbeard’s Steam Power Mod below or from anywhere, make sure the mod is compatible with the version of Forge installed. Place Flaxbeard’s Steam Power into your Mods folder. If you don’t have one, create it now. Flaxbeard’s Steam Power is created by TheSatanicSanta, the mod was created on Oct 12, 2014 and the last update took place on May 20, 2016, so far is a total of 621,866 downloads. If you are interested in more information about Flaxbeard’s Steam Power Mod, please go to CurseForge[link]. The Flaxbeard’s Steam Power Mod download links from below are available for Minecraft's most popular versions so far, for others version (likes as 1.12.1 / 1.11.1 / 1.10.1 / 1.9.2 / 1.8.8 / 1.8.4 / 1.7.2 / 1.6.4 / 1.6.2 / 1.5.2 / 1.4.7) please visit the official website above! We do not host any Flaxbeard’s Steam Power files on our website. We do not modify or edit the Flaxbeard’s Steam Power in any way. If you have any problem with Flaxbeard’s Steam Power Mod, please leave a comment below and we will help you as soon we can.